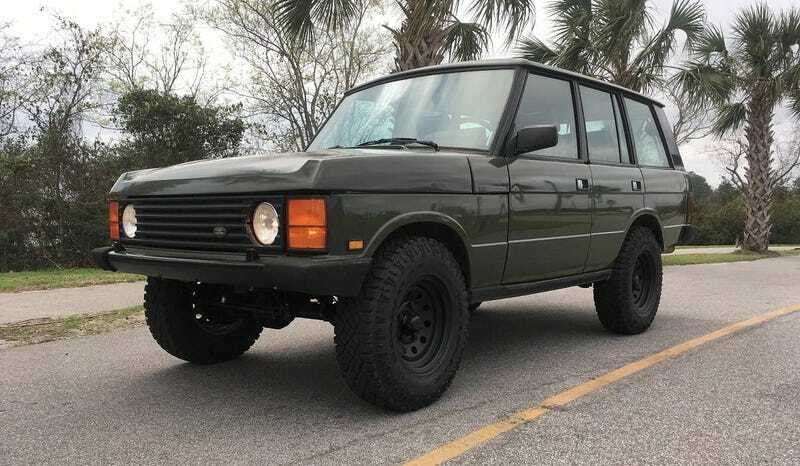 Is This 1990 Range Rover 300Tdi Unique Enough To Command $21,500? The seller of today’s Nice Price or Crack Pipe Range Rover Classic says it’s a unicorn owing to its diesel engine and manual transmission. Those are admirable features, but are they enough to justify its uncommon price? You know, when it comes to cars, rolling things is almost never a good idea. If you rollover you could do some serious damage and maybe even spill your Big Gulp. Rolling the odometer just racks up the mileage. Fat wheels and tires on your car may require that you roll the fenders, i.e. that you turn the right-angle inner lip of the wheel arch into one that’s tightly folded-over, thus allowing a half-inch or so more clearance. Is this really bad? Well, maybe not, but the fact that the seller of last Friday’s 2010 Infiniti G37S had done so—and then had gone the extra step of adding some kind of odd extensions to the rear fenders—didn’t play in his favor. In fact, the car’s mods, which were threatened to be on-going, were what really did it in. It’s $18,500 price was high enough to begin with, but based on the comments, those add-ons detracted rather than added to the value proposition, and the car fell in a spectacular 89-percent Crack Pipe loss. Tell me, is there a more incongruous marque than Range Rover? I mean, it’s a luxury brand that’s built for doing one of the most un-luxurious tasks in the automotive world—slogging through the mud, something its vehicles do with aplomb. With that raison d’être you would expect Range Rovers to be unflaggingly capable and tough as nails, which they are. Despite that rugged reputation however, Range Rovers also have a rep for breaking if you look at them funny. It’s almost laughable that a company whose products helped win WWII spent decades afterward seemingly baffled by simple features like power window winders or door latches. These are things you’d expect to work on any modern car without fail. On Range Rovers, they’ve always been hit or miss. Still, people all kinds of love old Range Rovers. Almost as much as they do the older and even hairier chested Defenders. This 1990 Range Rover Classic is evidence as to why these cars are so endearing. Just look at those simple lines! That wide-open greenhouse! The Range Rover’s design can be traced back to the late ‘60s, but I’d say that even in in its later four-door design it remains pretty timeless. This one, in dark olive over a black & tan (Mmmm, black & tan) interior is desirable for a couple of additional reasons. One is the 300Tdi engine under the aluminium bonnet. That 111-horsepower/195 lb ft of torque 2.5-litre turbo diesel four was never officially sold here in the States, but here it is in this Range Rover with a clean South Carolina title and its own set of plates. Good for it! The mill is said to have benefitted from a ton of recent work, including a machined head and new gaskets. That, along with a a slew of ancillaries and cooling system updates was all done within the last 500 miles and the seller includes some pics of the work in the ad. Other recent additions here are Old Man Emu shocks and metal springs to hold everything up, and new knobbies on 16-inch steel wheels. On top of that is a body that is claimed to have old but decent paint. The color is somewhat off-putting unless you’re into British Raging Green. The interior is okay, but it’s a little beat up and I don’t think the car came from the factory with beige carpet and doors and black seats. Still, the leather looks decent and apparently the whole thing has been off-brand Dynomatted. The walkthrough video he provides presents the car as reasonably quiet inside, although without fully masking its inherent dieselness. There’s no rot in the aluminum body, nor in the steel frame below, the seller says. He also notes that while the mileage reads 12K, that’s not accurate. Of course the fuel gauge reads UNLEADED ONLY and we know that’s a lie. We should perhaps take everything about this car with a grain of salt. One element that, at least based on the description in the ad, might strain credulity is the price, which is $21,500. Now, I should point out that this model of Range Rover presently comes in two forms here in the U.S.—clapped out fright pigs which typically go for about a grand of so, and well maintained examples that ask substantially more. This one seems to be in the baby bear realm, and seeing as it rocks that intriguing diesel-stick combo, it does appear as the seller says, to be a unicorn. The question for you now is: could that unicorn pull in the $21,500 the seller is asking? Or, does that just make it a horse of a different color? Charleston, SC Craigslist, or go here if the ad disappears.